Stairway Windows, Castlewood, Dunedin, New Zealand - Ramblings of Mad Shutterbug & the Border Collie Bros.
Castlewood is the name of the house, built early in the 20th century in Dunedin, New Zealand. The original owner was a lawyer; after his death the home went through several incarnations including a home for troubled youth. When we visited there, Peter and Donna ran the place as a Bed & Breakfast. Marvelous place, wonderful visit, excellent people. They've since retired from the B&B business. The filename on the scan is 20010910_120_2-05: Date, Type Film, Roll# & Frame. So 10 Sept, 120 film, 2nd roll, 5th frame. I'd kept a notebook during the trip listing notes about exposure and actual date/time for each frame. That notebook is hiding somewhere around here. I remember clearly that the date is for when I loaded the roll into the camera; often rolls were finished the day after. This is the case with this photograph, made on the morning of 11 September, '01. Peter, our host, also a painter walked up the stairs while I made a series of photographs of the landing window. He recognised the twin-lens format camera for what it is and we started talking art and media and techniques. 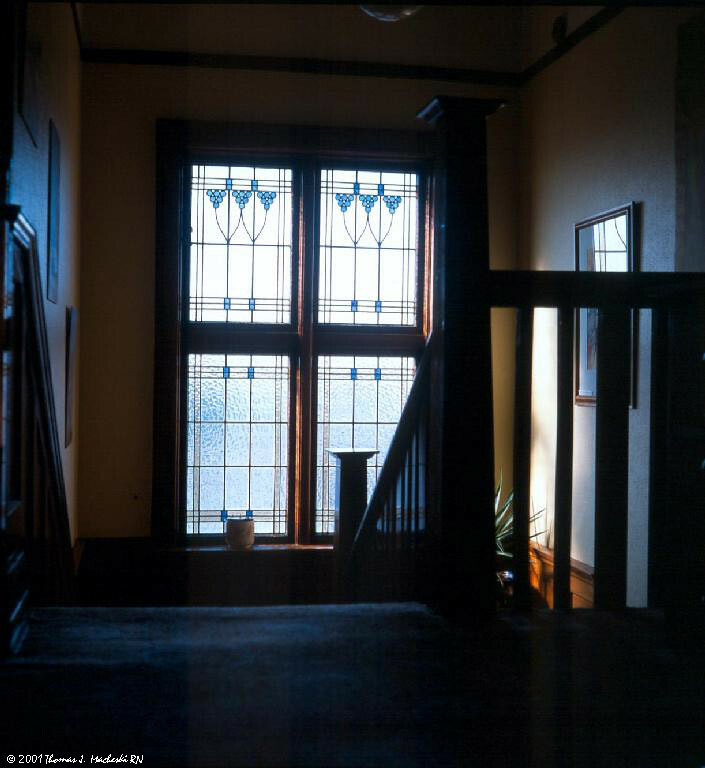 He invited me into one of their private rooms to photograph another stained-glass window, and later during our stay I photographed another one, downstairs in the Butler's Pantry and the Study (also used as the Breakfast Room during the B&B incarnation of the house). Then Herself and I set out to explore Dunedin, and take a scenic train ride up the Taieri Gorge. Memories of the date now known as 9/11 are, for me, always a bit... blurred, not confused, firm, and still blurred by that whole thing involving the International Date Line. Our room in Castlewood faced east, overlooking Otago Bay. I woke before the alarm went off the next morning (yes, even on our holiday we set the alarm... things to do, places to see! Set for a reasonable hour, though, not before the crack of dawn), and picked up the camera to photograph the sunrise over the bay and city. We learned about what happened when the radio alarm came on - and most of what happened did occur after midnight, our local time, so on 12 September for us. Blurred into two days by an international convention for when does the date change, anyway? It's a jumble, then, my memories of where I was, what I did. Which day is the day? Which memories? The day we woke up gradually, enjoyed breakfast, then photographed a few interior features of a Tudor-style/Craftsman-style house before walking about and seeing some interesting scenery? The evening of the most excellent meal in an outstanding restaurant named A Cow Called Berta? The morning after that day and evening, also waking gradually and enjoying a sunrise? Later that same morning, watching the events on the telly which Peter brought down to the Breakfast room? Because in all the public rooms of the house (including the guest rooms) there were no televisions, only their own personal one in their private rooms. Their philosophy as hosts at a B&B stated that while on holiday, their guests should be able to avoid any of the distractions of the work-a-day world. Except, this one. This one hammered and echoed and rebounded around and around and around the world, no matter ones viewpoint, that it was about time, that it was the most horrible thing ever. So this date is blurred and coloured by the light streaming in through stained glass windows made around 1912, windows which tinted the view of history through two World Wars and a dozen other wars between and about, windows which now are a part of my life. And from that we grow, and learn and live as people. I'm glad you liked what I said - I guess this year I am very aware of HOW people are reacting for some reason.